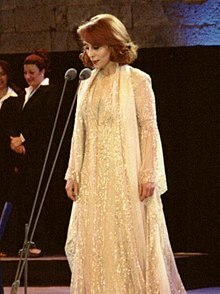 Fairuz (born November 21, 1935) is a Lebanese singer. She is an icon of the Arab world and is best known for her work with composers Assi, Mansour and Ziad Rahbani. "Lebanese diva is the voice of the Arab world". The Milwaukee Journal. October 4, 1989. Associated Press. 1G. This page was last edited on 7 September 2018, at 23:34.